Mark Langford started playing music in 4th grade on the saxophone, which he continued through high school. He started guitar at around the age of 13 and has since appeared in bands and as a recitalist on television, radio, and in concert halls since he began his professional career playing rock and roll guitar as a teenager in the late seventies in Northern California. Mark's first original rock band "Kreation" was formed in 1979 with Mark Langford guitar and vocals, George Ivonov on bass and vocals and Robbie Furiosi on drums and vocals. Then he moved to San Diego in 1980 and joined a top 40 band "Ruckus". The same year his Sacramento bandmates moved down to S.D. and Kreation was up and going again. In 1982 Mark took over the lead guitar role in "Enforcer", a San Diego Metal band after Warren DiMartini left for L.A. In 1983 he joined another San Diego Metal band "QuestHaven". In 1984 he joined a new Metal band "Bible Black" which had some local success opening up in San Diego for more well known bands such as Slayer, Stryper, Poison, Icon and several others as well as headlining their own shows. Bible Black won 1st place at a Battle of the Bands contest in 1985 that was held at Jack Murphy Stadium. In 1987 Mark joined a 10 piece Motown style band called "The Ravells" and played with them for about 2 years. In 1990 he joined a popular local band called " Danse Macabre" and played with them for a couple years. In 1992 Mark joined up with ex. Bible Blacksinger Scott Lief. They wrote and performed together as "Yesterdaze" through 1994. Mark started studying Classical Guitar around 1989 and has studied with World renown Classical guitarists Eliott Fisk, Flavio Cucchi, Celin and Lito Romero. He started studying and performing Flamenco Guitar around 1998 and since has studied with great Flamenco guitarists Juan Serrano, Manolo Sanlucar, Gerardo Nunez, Manolo Franko, Paco Serrano and Jose Antonio Rodriguez. 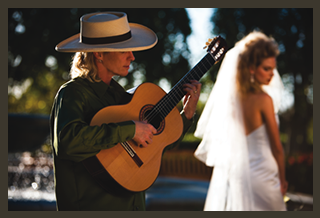 Mark has mastered an extensive repertoire of Spanish Classical guitar masterpieces and all the forms of Flamenco. Mark has performed for conventions for major corporations such as AT&T, Audi, Hertz, Kinko’s, MCI, Merck, Merrill Lynch, Mitsubishi, Pfizer, and hundreds more since 1990. Performances for President Gerald Ford, Ex. Mexico President Vicente Fox, Governor Pete Wilson, U.S. Congressmen, California State Assemblymen and several San Diego mayors. Mark was chosen to perform for the National Association of Music Merchants and the World NAMM VIPs. Mark started a sound company in 1981 working with San Diego local bands then became the sound-man for a successful Surf & 60's band "The Mar Dels". He started freelancing and worked with many local, national and international musicians as well as dignitaries and events, including Mother Teresa, the Russian Symphony’s first United States tour, the Buddhist Monks’ first United States tour, Bob Crosby Orchestra, Jewel, Chris Isaak, Dwight Yoakum, Chris Kristofferson, Warren Zevon, Keane Reeves, John Entwistle (the Who), Bill Bruford (Yes), Alan Holdsworth, A.J Croce in 1996 (where he met John F. Kennedy Jr.) and many more. Mark released his first compact disc “Recuerdos De Amor” in 2001, and his Christmas CD “Holy Night” in 2003. Rock and Roll and his own original music.